At our annual Congregational Meeting on Wednesday, June 20, several new officers and members of our Board of Directors were elected. Succeeding Alan Spector as President of Adas Emuno will be Lance Strate, after having served a term as Vice-President. Board member Michael Raskin will in turn take on the responsibilities of our congregation's Vice-President. And past president Virginia Gitter will be taking over as Recording Secretary, as Robyn Labombarda steps down from the Board. Mark Rosenberg will continue to serve as Financial Secretary, and Michael Fishbein as Treasurer, while Alan Spector will now hold the office of Immediate Past President. All of the officers serve two-year terms. As for the Board of Trustees, Fred Friedman and Lauren Rowland were elected to three-year terms, while Rebecca Kind-Slater was appointed to fill out a 1-year unexpired term. The new officers and trustees officially begin their terms on July 1st. On behalf of the entire congregation, we say Mazel Tov and especially Todah Rabah to you all for your service to Adas Emuno! I’m very happy to write about this week’s Torah portion, Shelach Lecha from the Book of Numbers; it was my bar mitzvah portion some four decades ago! As a young teen I was very impressed by the fact my portion was primarily an intriguing spy story. At the same time, I was happy to note that the very end of the portion contained the important commandment of the tallit. We are told that the purpose of wearing the fringed garment is to be “holy to your God” (Numbers 15:40), and it is this point that I would like to address. One of the most important words in Judaism is kadosh, holy. From that root we get kaddish, the memorial prayer that sanctifies God’s name; kiddush, the blessing over the wine that sanctifies the Sabbath and other holy days; kiddushin, the traditional term for marriage that understands the union of a man and women as holiness. The synagogue is traditionally called the kehillah k’dosha, the holy community, reflecting the fact that we are called upon to be goi kadosh, a holy people. We term our sacred books in Judaism sifrei kodesh. Jerusalem is called ir hakodesh, the holy city and the inner sanctum of the great Temple that housed the ark is called kodesh kedoshim, the holy of holies. Even the angels, according to Isaiah, are said to sing kadosh, kadosh, kadosh, and those are words we repeat in the Amidah prayer. Among the most important Torah portions is K’doshim in Leviticus, because it contains the famous Holiness Code that begins: K’doshim t’hiyu, You shall be holy, for I, the Lord your God, am holy. So it comes as a shock that in the very next words of Torah after the description of the tallit a major debate about the very nature of holiness erupts. The debate is between Moses and his cousin, no less, named Korah, whose name commences next week’s portion. Korah to Moses and Aaron: You have gone too far! For all the community are holy, all of them, and the Lord is in their midst. Why then do you raise yourselves above the Lord’s congregation? Moses to Korah: Come morning the Lord will make known who is His and who is holy…. Korah: You think you are the only chosen ones. We are too. Moses: The man whom the Lord chooses, he shall be the holy one. You have gone too far, sons of Levi! But let’s not get ahead of ourselves. The sages wonder, in connection with this week’s portion, how the tallit enhances holiness. Yes, the act of wearing a fringed garment is a physical reminder of a Torah commandment, but there is more, and it has to do with the blue thread. “The blue suggests the sea, the sea suggests the heavens, and the heavens suggest the Throne of Glory,” wrote the rabbis. Even small acts, and simple things, can elevate us toward the holy. And to this sage exegesis, we might add, congratulations on the anniversary of becoming bar mitzvah, Rabbi Schwartz! As an occasional guest blogger for the Hannah Arendt Center for Politics and Humanities at Bard College, I'm asked to choose a quote from her writings, and provide a bit of discussion about it. I previously shared with you my post on Hannah Arendt and Charlie Chaplin, and I thought I would also share my latest entry. Hannah Arendt was a Jewish German-American philosopher and political scientist, perhaps best known for her reporting on the Adolph Eichmann trial for The New Yorker, Eichmann having been the Nazi in charge of the concentration camps; that work was later published in revised form as Eichmann in Jerusalem: A Report on the Banality of Evil. In philosophical circles, her most influential work is The Human Condition, and my post begins with a quote from that work. I should warn you that, while the underlying sensibility is certainly Jewish, there is very little overtly Jewish content in this post, at least not until the end. But I hope that you find it of interest nevertheless. "The human condition comprehends more than the condition under which life has been given to man. Men are conditioned beings because everything they come in contact with turns immediately into a condition of their existence. The world in which the vita activa spends itself consists of things produced by human activities; but the things that owe their existence exclusively to men nevertheless constantly condition their human makers." The human condition is the context or situation we, as human beings, find ourselves in, the implication being that human life cannot be fully understood by considering humanity in isolation from its environment. We are, to a large degree, shaped by our environment, which is why Arendt refers to us as conditioned beings. We are conditioned by phenomena external to us, and this may be considered learning in its broadest sense, that is, in the sense that the Skinnerian conditioned response is a learned reaction to external stimuli. It follows that any form of life that is capable of modifying its behavior in response to external stimuli is, to some extent, a conditioned being. On a grander scale, natural selection, as it is popularly understood, can be seen as a conditioning force. Survival of the fittest is survival of those best able to adapt to existing external conditions, survival of those best able to meet the conditions of their environment. The fittest are, quite naturally, those in the best condition, that is, the best condition to survive. Whether we are considering the effects of natural selection upon an entire species, or individual members of a species, or what Richard Dawkins refers to as the selfish gene, the environment sets the conditions that various forms of life must meet to survive and reproduce. Such views are inherently incorrect insofar as they posit an artificial separation between the conditions of life and the form of life that is conditioned. An ecological or systems view would instead emphasize the interdependent and interactive relationships that exist, as all forms of life alter their conditions simply by their very presence, by their metabolism, for example, and through their reproduction. Darwin understood this, I hasten to add, and the seeds of ecology can be found in his work, although they did not fully germinate until the turn of the 20th century. And Skinner certainly was aware of the individual's capacity for self-stimulation, and self-modification, but a truly relational approach in psychology did not coalesce until Gregory Bateson introduced a cybernetic perspective during the 1950s. In the passage quoted above, it is readily apparent that Arendt is an ecological thinker. In saying that, "the things that owe their existence exclusively to men nevertheless constantly condition their human makers," she is saying that we create the conditions that in turn condition us. We exist within a reciprocal relationship, a dialogue if you like, between the conditioned and the conditions, the internal and the external, the organism and its environment. The changes that we introduce into our environment, that alter the environment, feedback into ourselves as we are influenced, affected, and shaped by our environment. The story of the Coke bottle, although fictional, follows the pattern of many documented cases in which the introduction of new technologies to traditional societies has had disruptive, and often enough, disastrous effects (the film itself, I hasten to add, is marvelously comedic, and quite often slapstick following the introductory quarter hour). The understanding that we are conditioned by the conditions we ourselves introduce was not unknown in the ancient world. The 115th Psalm of David, in its polemic against idolatry and the idols that are "the work of men's hands," cautions that "they who make them shall be like unto them; yea every one that trusts in them." Along the same lines, the Gospel of Matthew includes the famous quote, "all those who take up the sword shall perish by the sword," while the Epistle to the Galatians advises, "whatsoever a man sows, that shall he also reap." A more contemporary variation of that maxim is, "as you make your bed, so you shall lie on it," although in the United States it is often rendered in the imperative and punitive form of, "you made your bed, go lie in it!" During the 19th century, Henry David Thoreau notified us that "we do not ride on the railroad; it rides upon us," while Mark Twain humorously observed that, "if all you have is a hammer, everything looks like a nail." More recently, we have been told, "ask a silly question, get a silly answer," to which computer scientists have responded with the acronym GIGO, which stands for, "garbage in, garbage out." Winston Churchill said, "we shape our buildings, and thereafter they shape us," and former Fordham professor John Culkin, in turn, offered, "we shape our tools, and thereafter they shape us," as a corollary to Marhsall McLuhan's media ecology aphorism, "the medium is the message." In addition to the conditions under which life is given to man on earth, and partly out of them, men constantly create their own, self-made conditions, which, their human origin and their variability not withstanding, possess the same conditioning power as natural things. The "conditions" that we make are used to create a buffer or shield against the conditions that we inherit, so that our self-made conditions are meant to stand between us and what we would consider to be the natural environment. In this sense, our self-made conditions mediate between ourselves and the pre-existing conditions that we operate under, which is to say that our conditions are media of human life. And in mediating, in going between our prior conditions and ourselves, the new conditions that we create become our new environment. And as we become conditioned to our new conditions, they fade from view, being routinized they melt into the background and become essentially invisible to us. Whatever touches or enters into a sustained relationship with human life immediately assumes the character of a condition of human existence. This is why men, no matter what they do, are always conditioned beings. Whatever enters the world of its own accord or is drawn into it by human effort becomes part of the human condition. The impact of the world's reality upon human existence is felt and received as a conditioning force. The objectivity of the world—its object- or thing-character—and the human condition supplement each other; because human existence is conditioned existence, it would be impossible without things, and things would be a heap of unrelated articles, a non-world, if they were not the conditioners of human existence. This last point is quite striking. It is we, as human beings, who create worlds, which brings to mind the moving commentary from the Talmud: "whoever saves a life, it is considered as if he saved an entire world." We create worlds, in the sense that we give meaning to existence, we attribute meaning to phenomena, we construct symbolic as well as material environments. Each one of us, in our singular subjectivity, creates a world of our own, and therefore each one of us represents a world unto ourselves. But these individual worlds are links, nodes in a social network, interdependent and interactive parts of an ecological whole. The term condition, in its root meaning is derived from the Latin prefix com, which means together, and dicere, which means to speak. And our ability to speak together, to engage in discussion and deliberation, to enter into symbolic interaction, constitutes the means by which we collectively construct our intersubjective, social realities, our worlds. As human beings, we are conditioned not only by our labor, the ways in which we obtain the necessities of life, i.e., air, water, food, shelter, to which Marx sought to reduce all aspects of society, a position that Arendt severely criticized. We are conditioned not only by our work, which Arendt associated with artifacts, with instrumentality and technology, with arts and crafts. We are conditioned most importantly by action, which in Arendt's view is intimately tied to speech and the symbolic, and to processes rather than things, to relations rather than objects. In the end, Arendt reminds us that the human condition is itself conditional, and to be fully human requires not only that we take care of biological necessity, nor that we make life easier through technological innovation, but that we cooperate through speech and action in collectively constructing a world that is truly blessed with freedom and with justice. This YouTube video, entitled "I Am Jewish", was brought to our attention by Rabbi Schwarz, and it is truly marvelous. The main portion was written and performed by Andrew Lustig, and the video was filmed and edited by Tracie Karasik, produced by Harold Messinger, Raffael Lomas, Andrew Lustig, and Tracie Karasik, with camera equipment provided by Jacci Chanon and Harold Messinger, and filmed at Brandeis-Bardin Campus of the American Jewish University in Simi Valley, California. The background music is the "Theme from Schindler's List" performed by Itzhak Perlman, John Williams, and the Pittsburgh Symphony Orchestra, composed by John Williams, from the album, Cinema Serenade; and "Watermark" performed by Enya, composed by Enya and Roma Ryan, from the album Watermark. On the YouTube page for "I Am Jewish", the write up includes, "Special Thanks To The Staff and Participants of BCI Aliyah 2011," "©2012 Andrew Lustig All Rights Reserved," and "©2012 Tracie Karasik Media. All Rights Reserved." I am all the words in Yiddish I've been called all my life that I still don't understand. I am going to all three Phish shows this weekend. I am my melody of Adon Olam. I am my melody of Adon Olam. The words may be the same but I am my melody of Adon Olam. I am not getting Bar Mitzvahed. I am a Bar Mitzvah. I am a concept foreign to the rest of the world. I am not Judaism. I am sleep-away camp. I am your grandmother who's seen Chortkov and Auschwitz, who's seen '49, '67, and '73 and whose tired of trying to make peace with those people who just want to blow up buses and destroy her people. I am the 19 year old who's seen Budrus, Don't Mess With the Zohan, and Waltz with Bashir and who thinks -- who knows -- peace is possible. I am never asked if I have horns or a pot of gold, if I rule the world or why I killed Jesus. I am asked where my black hat is, if I really get 8 presents on my Christmas, why my sideburns aren't super long, and if I've really never tried bacon. I am asked what a Gefilte Fish is. I say, "I don't know. I don't like it. Nobody does. But we eat it because its what we do." I am asked if my dad's a lawyer. I say "no... my mom is... my dad's an accountant." I am asked if my grandparents were in the Holocaust as if it were a movie. "Yeah, they were. But luckily they were also on Schindler's List." I am on JDate and not Match.com because, well, it's just easier that way. I am that feeling of obligation to buy the Dead Sea salt at the mall kiosk because you know the woman's Israeli. I am an IDF sweatshirt and the Chai around your neck. I am a $100 Challah cover you will never use and a 5 Shekel piece of red string you will wear until it withers away. I am your Hebrew name. I am your Israeli cousins. I am your Torah portion and your 13 candles. I am your Bat Mitzvah dress and the cute Israeli soldier on your Birthright trip. I am 18 when I discover that Israel is not actually a garden of Eden of milk and honey where Jews of all backgrounds, ethnicities, and styles of worship come together -- eternally happy and appreciative -- to do a constant Hora in the streets of the promised land. I am the way your stomach forgets to be hungry and your lungs forget to breathe when the Rabbi commands the final Tekiah Gadolah and an entire congregation -- a congregation that is not any one synagogue but an entire people -- listens to what on January 1st is a ball dropping in Times Square, but today -- any day in late September or early October for the 5770th time is a Ram's horn being blown into for what seems like 10 minutes, like the 8 days the oil burned, and how David defeated Goliath, and how Moses parted the seas -- it would have been enough, dayenu -- how we won the war, and how your grandparents survived, Nes Gadol Haya Sham -- Shana Tova -- time for bagels and lox. I am Jewish. And we have to say, todah rabbah and mazel tov to Andrew Lustig, Tracie Karasik, and everyone involved in the creation of this brilliant bit of filmmaking, and to Brandeis Collegiate Institute as well. Our landsmen out in California may not know how to make a reuben sandwich right (see our previous post, Rue the Rueben? ), but they certainly know how to make a movie! Here now is the third in a three-part series of posts related to my visit to Israel in March, following Speaking of Israel and Israel's Image Wars. In addition to the radio interview which I featured in the last post, I was also interviewed by a reporter for the Jerusalem Post, Israel's leading English language newspaper, for a feature that appeared in their Friday magazine (the equivalent of our Sunday papers' magazine sections). The interview appeared the week after I was there, in the issue cover dated March 23, but you can also find it online where it's dated March 22, all under the title: Assessing the Media. On a recent visit here, Dr. Lance Strate, discusses social media and how they help facilitate social change. Over the past century, for better or for worse, governments, social action groups, private individuals and others have used traditional forms of media to effect change. But with the emergence of the Internet and new-media outlets, a vast array of other electronic tools have become available. The last couple of years saw three major attempts at effecting change utilizing this new technology: the 2010-11 Arab Spring throughout the Middle East, the 2011 Occupy Wall Street Movement (OWS) and last summer’s local social justice tent protests. 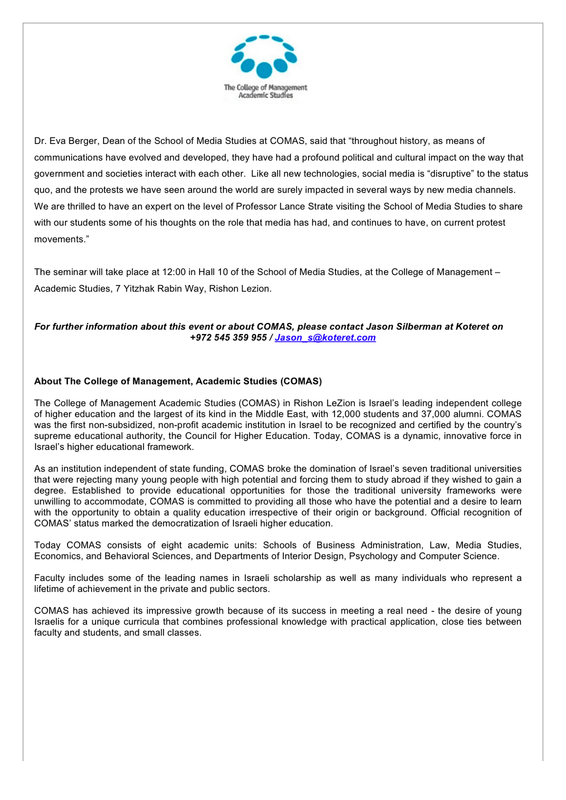 Dr. Lance Strate, a professor of communication and media studies and the associate chair for graduate studies at New York’s Fordham University, was recently in Israel as a guest of the School of Media Studies at Rishon Lezion’s College of Management Academic Studies (COMAS). The communications expert – who did his doctorate under author, media theorist and cultural critic Neil Postman at New York University – delivered a series of lectures to COMAS students and faculty on the impact of social media. One of the sessions was titled “Media, Protest, and Social Change,” and some of last summer’s tent protesters attended the lecture. The Jerusalem Post caught up with Strate following his talks. What was the focus of your lectures here in Israel? I gave three talks here. 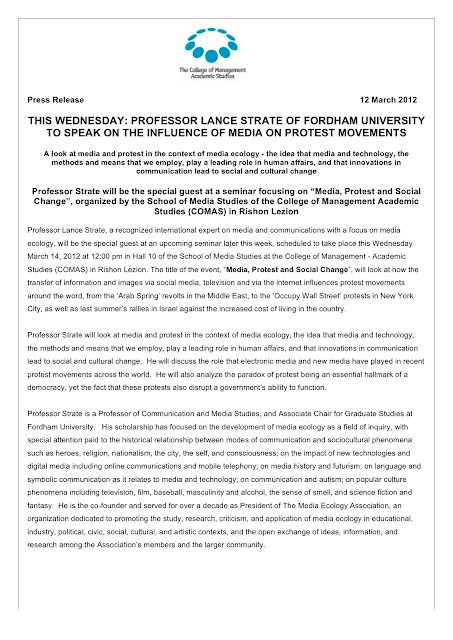 One was a talk on media ecology, another on new media, and the third was on media and their role in the recent protests [around the world]. Media ecology is the study of forms of media as environments. So the idea is that media play a leading role in human affairs. The media shape the way we think, the way we feel, act, and how we perceive the world, and our culture and social organizations. Can you discuss the role social media played in the Arab Spring? Social media played a significant role in facilitating the protests and movements that collectively became known as the Arab Spring. The role of media [in any form] was not clearly recognized in previous decades, but now it has become much more apparent [especially social media]. It’s true that a mobile device can’t stop a bullet, but that’s not all there is to it. Part of the impact [of social media] is its ability to organize people, connect people and mobilize people toward a common cause. Also, now there is the idea that people can have a sense of involvement even at a distance. You no longer have a passive audience viewing images on television, but even something as simple as clicking “Like” on Facebook gives people a sense of involvement. But in regard to social media and the Arab Spring, you have to be cautious. This is not necessarily a movement toward democratization. We associate democracy as an idea born out of print culture. And print culture and other institutions formed through print culture are in decline or are on the way out. Change doesn’t come easily, but it does come sooner or later. What we don’t know is what new forms of social organizations will appear. When radio was introduced, we were given the totalitarian movements of communism, fascism and Nazism. You could suddenly appeal to mass audiences and mobilize them or even cause mass panic. On the other hand, intimate connections were made between a personality speaking [on the radio, and the audience], thus creating a new cult of personality. We should not assume that movements like the Arab Spring are going to result in the kind of democracies that have emerged in the West. In all likelihood they will not. It’s not a matter of being pessimistic I’m just realistically assessing the situation. We have a different media environment today than the environment which was associated with the Enlightenment that gave rise to nation states and democratic governments of the West. For that reason, we can’t assume we are going to see the same development. Electronic communication bypasses structures that were built around print culture. People used to have access to news in a digestible form through print media and could get together to discuss it locally, which created stability. But now we see a great deal of instability and complexity. People are connecting despite geographical differences. It used to be that a person’s loyalty was to his tribe or his nation, but now their loyalties are to different groups they are connected to, making it a much more complicated world we live in. This leads to separatism. You have a group that breaks apart, then another small group that wants to break out, and there is no end to it. What are possible negative ramifications of that phenomenon? It’s dangerous. We are not prepared for these developments and don’t know how to deal with them. When the United States went into Iraq, they asked themselves, “Should we allow the country to disintegrate into small homogeneous units, or preserve the nation as a whole?” And the US, being a nation state, took the position to try and preserve a nation state. On other side of the coin you have Yugoslavia, the Czech Republic and even Scotland, [which] now wants to leave the United Kingdom, so this is the direction that electronic media can lead us toward. In the end, we have to expect new structures to begin and to form in a way that does not fit into what we have previously seen, and can conflict with what’s existed before. But before we had social media, we had the Holocaust. How much worse can it get than when social media didn’t exist? Well, you have to realize that on the other side of the coin, something like the Holocaust could not be kept a secret today. One of the features of new media is the proliferation of images. And images evoke emotional responses. Something like this [the Holocaust] would be publicized and cause great outrage. We see [this outrage] over and over, with what’s going on in places like Syria and Iran. In all these places, it’s too easy to get information out for any kind of authority to control and operate in secrecy. On the other hand, it opens a new door – for example, what we are seeing in Gaza. The images we see don’t promote rational thinking, they elicit emotional responses. Those images require framing, since we don’t know when and where images are really taken and there are ways people can be manipulative to fit their “image culture.” In that sense, social media are not positive – but still, it would be hard to pull off another Holocaust or another genocidal campaign without world awareness. You just can’t hide it. 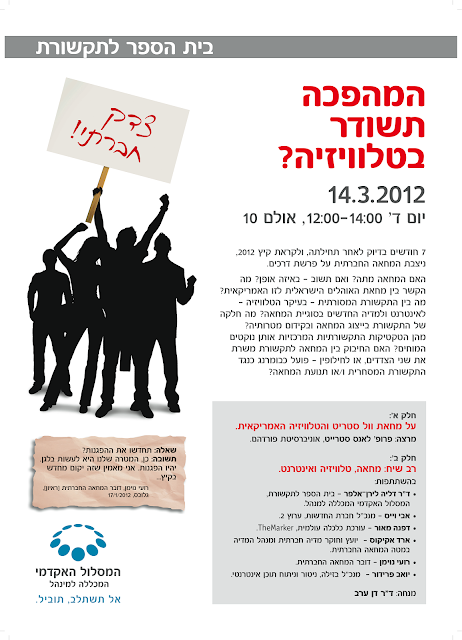 Changing topics, what were some of the tangible results of the OWS movement as a result of social media? The strength of social media in this instance was to facilitate the organization of events and the mobilization of people. That was effective. There were also some quite wonderful things going on that involved people using social media, such as protest supporters ordering pizzas for the protesters online. [That said,] I was a guest on a talk radio show and they had an OWS organizer call in, and she said she was disappointed that the [mainstream] news media didn’t cover the protests adequately. I tried to explain to her why they didn’t get the same coverage as the Tea Party movement did. The problem is... TV favors close-up cameras focusing on personalities, on faces. The Tea Party was personified by certain people, such as Sarah Palin and Michele Bachmann. They provided a face and a voice for the movement. And that’s what TV wants. In the United States, television stations can’t do a good job of covering Congress because what you see is a large group of people sitting around. That’s bad television. Instead you get an exaggerated view of the president because you can get nice closeups of him. This distorts the images of what government is and probably has to do with the dysfunctionality of Congress in recent years. The OWS movement didn’t produce distinct personalities or spokespeople. So while there were visual images of tents in a public park, that only provided a backdrop for various news reporters to provide their own views and explanations. When I explained this to one of the OWS leaders, she said, “We don’t want to fall into the trap of left-wing individualism.” But TV is not about private individuals, it’s about audio and visual personalities, and that’s why the movement didn’t get the same coverage cache as the Tea Party. But again, social media were effective in organizing people and the grassroots work on the ground. This is also how President [Barack] Obama was successful in using social media effectively on the campaign trail, not to persuade voters, but to organize campaign workers. The problem is trying to use social media to reach the mass media, and that’s not possible. The mass media and TV have a different bias, and that’s the point the OWS movement missed. Was the goal to use new media to target old media structures, including the government, or do you use new media to bypass old media? They were not clear as to their intentions; hence the movement was a failure – they didn’t get much of anything out if it except expressing a generalized sense of dissatisfaction. By contrast, look at the effective social movements of the 1960s. They had genuine personalities and musicians on board, which gave a face to the movement. [The point is,] if you want to deal with a certain medium, you have to deal with it on its own terms. How did the Israeli tent protesters demanding cost-of-living reform fare last summer utilizing social media? [Unlike in the OWS movement,] some personalities did emerge, but again, the bottom line is that they were trying to use the new media to organize and also reach the old media structures, including the government and professional news media. In the long run, perhaps that might turn out to form the basis of a successful campaign, but the alternative is to use the new media to create new structures. It’s difficult but could be more effective to bypass [traditional] news media and communicate directly to the audience, while also bypassing the government and creating other forms of organization. But were they not somewhat successful, since the government took notice and formed a committee to propose economic solutions? The organizers didn’t feel like it was a success. While they did get some kind of response, I didn’t get the sense (from the organizers I spoke with who attended my lecture) that they were satisfied with the overall outcome – including dissatisfaction with news coverage and a dissatisfaction with the government response. The real problem with the movement, though, I feel, is that they never really articulated their goals. Will we one day see the death of traditional media, specifically newspapers? Right now newspapers are not entirely disappearing, but being turned into something less common. When we think of a newspaper, we think of wrapping fish in it, stacking newspapers and those stacks being thrown out. Newspapers are disposable, so it makes perfect sense for that disposability to be shifted to an entirely electronic form [one day]. Eventually newspapers and even their online versions cannot survive. If you want to check your horoscope, read a cartoon, get a financial report, why go to a newspaper or its website when you can go to a specialty site? I do believe that a market for professional news-gathering will always remain; however, it will evolve into a form that’s fully given over to the online environment. But as I said, there will be too much competition from specialized sources to have newspapers online long term. [Still,] the tradition of professional newspaper-oriented journalism and journalists will remain a commodity. To follow up on my previous post, Speaking of Israel, while I was visiting in the Tel Aviv area, rockets were being fired from Gaza into southern Israel, and Israel was responding with air strikes against the Palestinians. You can read about the exchange of hostilities on Wikipedia under the heading of March 2012 Gaza–Israel clashes, and this post relates to the topic briefly covered towards the end of that entry, on the Twitter hoax. This has to do with an image that some may find disturbing, as it shows a Palestinian man holding a little girl who appears to be unconscious, and covered in blood. I decided not to include the image here, but if you want to see it, I did include it in the post on this topic that I put up on my own blog, Pictures and Propaganda. But perhaps you've seen it already, identified as the picture of a Palestinian girl wounded in an attack by the Israeli army or air force? Maybe just recently, or maybe in years past? If so, and if you've felt anger, or outrage, or shame regarding the Israeli military, you've been propagandized. This is not to say that the Israeli Defense Forces are free from committing offenses, no military is without error or sin, after all. But in this specific instance, the little girl was injured in an accident on a swing, and this picture has been used repeatedly, during different conflicts, spread in viral fashion via email, websites, Facebook, and Twitter, and picked up repeatedly by respectable news organizations that seem to be no longer capable of fact checking. But the fault lies not so much with our newscaster stars, and supporting players, but with in the nature of images. It is no accident that the Second Commandment expressly forbids the creation of any kind of graven image. To move past a mythological mindset and into one governed by reason, it was necessary to ban images, so that words (and "the word of God') could prevail. Simply put, the image in and of itself, carries no set information about its date or place of origin, about the circumstances of the moment in time that it depicts. No context. Any statement that we might think an image makes must be made via words, which is why we look to captions in print media or online, and look at the title of paintings in museums. Pictures are not worth a thousand words, nor are they worth a single word. Pictures and words are apples and oranges. Verbal statements can be evaluated as true or false. Pictures may be judged faked or genuine, but otherwise, they are what they are, entirely concrete, referring to nothing else but the surface impression that they capture. In this sense, images are not facts that can be checked or evaluated (facts can be proven true or false, meaning that there is such a thing as a false fact). Images can be used as evidence, to support a claim, but the claim itself must be made in words. Newscaster: The Palestinians in Gaza have been gearing up their propaganda machine with a string of photos, showing the alleged violations of the Israeli army. These photos are being released on Facebook, Twitter and to news agencies like Reuters, who, for example, released a picture of a bleeding girl, carried by her father. Later on they had to issue a correction, when they discovered the picture had already been released three times: in 2006, 2009 and now again. And the girl had a swinging accident, nothing to do with a crisis in Gaza. Now, another picture is in circulation of what looks like the boot of an IDF soldier stamping a young Arab girl, who's lying on the ground. An officer from the special unit in the IDF spokesman's office, who looks at the provenience of these pictures, told Channel 2 TV News, the picture comes from Bahrain and has nothing to do with the Mid East crisis in this region. Well, is this a known phenomenon? 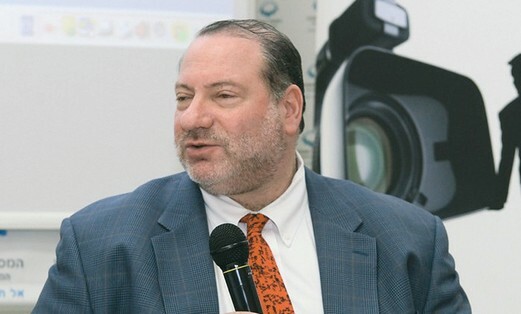 That is the question we asked Lance Strate, Professor of Communication at Fordham University in the US, who is in Israel presently as a guest lecturer at the School of Media Studies, College of Management and Academic Studies in Rishon LeZion. Lance Strate: It comes down to the fact that pictures, first of all, have an enormous impact, well beyond words. Simply, words leave us distanced from the topic. And pictures speak to us in an immediate way, and in a powerful way. They elicit emotional responses, and particularly pictures of that sort elicit anger and moral outrage. So, they are a very powerful weapon to be wielding. Reporter: Now, a respectable network, like Reuters, has used the same picture three times, in 2006, 2009 and now once again. A picture of a child with a bleeding face being carried by her father. And in the end they found out they have to issue an apology that this has nothing to do with war or fighting, she was actually hurt by a swing or something. Why can''t a respectable organization like Reuters, check their pictures. Lance Strate: It's a great question, and actually one problem would be just turn over of personnel. But the bigger problem is that you simply cannot do a search on images the way you can for verbal statements. If you think about doing a Google search, for example, you can say, if you have a quote, let's do a Google search and you can find out where that quote comes from. But if you have an image in front of you, there's no way to plug it into Google and find that image on the Internet. And there's nothing in the image that helps you to identify where and when it was taken necessarily. And I know, they're developing technology that is going to solve this problem or, at least, alleviate the problem, but we are not quite there yet. Newscaster: Professor Lance Strate, a specialist in communication and media studies. But: A. most people don't use them. B. It's hard to find the "zero patient" picture, or where it all began. And of course, the bottom line is that finding the images elsewhere on the web does not guarantee that you can identify the source, and may in fact reinforce the false attribution, one of the pitfalls of crowdsourcing. And, of course, quotations can also be misidentified, but still, they are much easier to identify than images, that should be obvious, and their impact is not the same as the immediate and emotional effects of the visual image. Anyway, I do think it was altogether appropriate that this subject was covered on radio, a medium that is entirely devoid of the visual image. A sound decision, I'd say. Do you see what I mean? I thought I would share with you some items from my trip to Israel this past March. I was a guest of the College of Management and Academic Studies in Rishon LeZion, a town not far from Tel Aviv. COMAS is the acronym they use, at least when they use the Roman alphabet, and it's the largest college in Israel according to its Wikipedia entry. 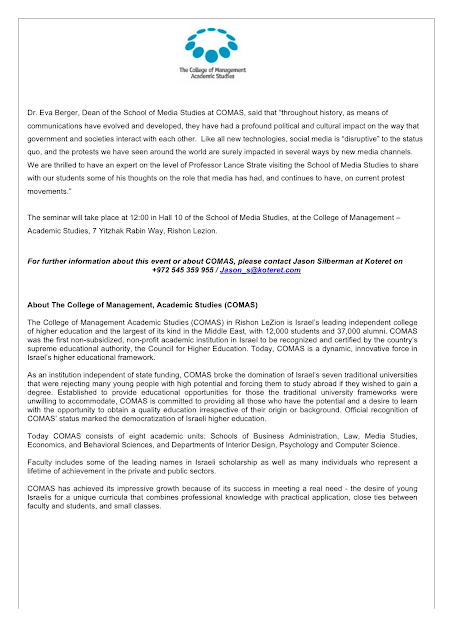 COMAS is much more than a business school; it is, in fact, a full-fledged university, but has held onto its original name because it's an established brand here in Israel. Anyway, within the College there is a School of Media Studies, and the Dean is an old friend of mine from my graduate school days at New York University, Eva Berger. 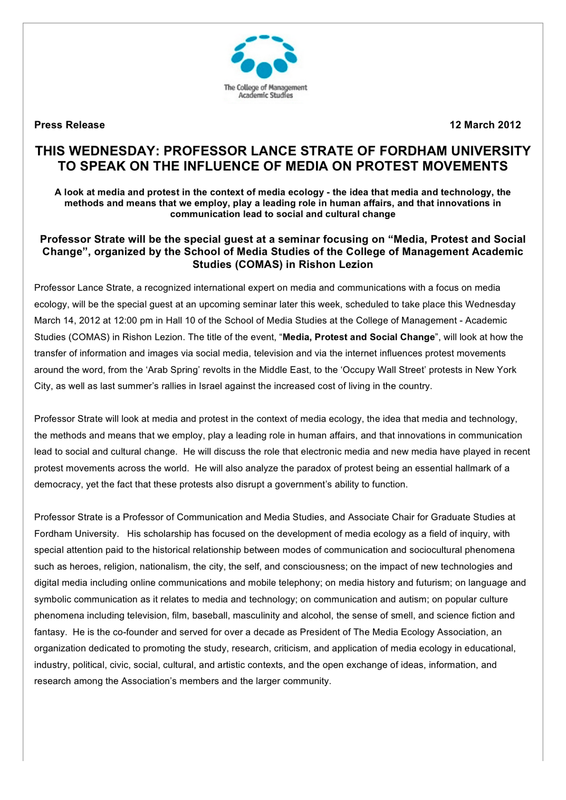 While I was there, I gave a talk about media ecology to the faculty on Sunday, March 11. As you may know, in Israel, Sunday is the first day of the week. Well, actually, Sunday is the first day of the week everywhere, that's why it goes all the way on the left side of calendars, but in Israel it's the first day of the work week, and Friday is the first day of the weekend. By the way, the days of the week in Hebrew literally translate as First Day, Second Day, Third Day, Fourth Day, Fifth Day, Sixth Day, but the seventh day (Saturday) is actually called Shabbat, which of course means Sabbath. Anyway, on Monday, March 12 I gave a guest lecture to a class on new media, the students were bright and attentive, and it was a real pleasure. Thankfully, my talk didn't generate too much protest on the part of the participants, although things did get a bit heated in the panel discussion that followed, between organizers of an Israeli protest movement from last summer, and a TV news executive who called their movement a failure. Of course, it wouldn't be Israeli without some arguing, and great debates are a part of our tradition (see the previous post on this blog, Judaism's Great Debates Now in Print!). During my visit, I also got to spend a little time with my cousins, who also live in the Tel Aviv-Rishon LeZion area, and with some old friends, for which I am grateful. And I was asked to do a couple of media interviews, which I will share in the next two blog posts here. 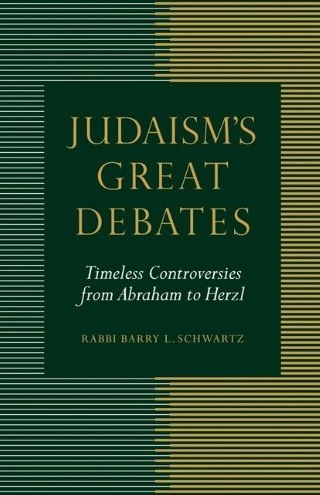 We members of Congregation Adas Emuno extend our sincere congratulations to our Rabbi, Barry L. Schwartz, on the publication of his latest book, Judaism's Great Debates: Timeless Controversies from Abraham to Herzl. 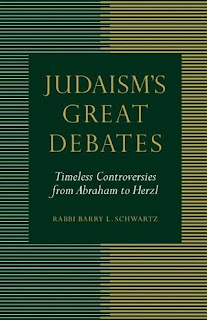 In this concise but important survey, Rabbi Barry L. Schwartz presents the provocative and vibrant thesis that debate and disputation are not only encouraged within Judaism but reside at the very heart of Jewish history and theology. In his graceful, engaging, and creative prose, Schwartz presents an introduction to an intellectual history of Judaism through the art of argumentation. Beyond their historical importance, what makes these disputations so compelling is that nearly all of them, regardless of their epochs, are still being argued. Schwartz builds the case that the basis of Judaism is a series of unresolved rather than resolved arguments. Drawing on primary sources, and with a bit of poetic license, Schwartz reconstructs the real or imagined dialogue of ten great debates and then analyzes their significance and legacy. This parade of characters spanning three millennia of biblical, rabbinic, and modern disputation reflects the panorama of Jewish history with its monumental political, ethical, and spiritual challenges. Rabbi Barry L. Schwartz is the director of The Jewish Publication Society in Philadelphia and the spiritual leader of Congregation Adas Emuno in Leonia, New Jersey. He is the author of the acclaimed textbook Jewish Heroes, Jewish Values and several other works. Judaism’s Great Debates is also being published in a student edition by Behrman House, Inc.
Now if all this hasn't convinced you to read the book, you can read an excerpt (pdf) and see what you'll be missing if you don't get a hold of a copy. It really is a must read for anyone interested in Jewish history, culture, and religion. And that, dear friends, is not open to debate!